Pirbright – a tranquil Surrey village with one of the loveliest of village greens, pond and cricket pitch. A place I know well as my mother-in-law (or to be really precise, my late ex-mother-in-law) was a Pirbright lady born and bred and she retained her roots with the village all her life. In fact, my first wedding reception was held at Lord Pirbright’s Hall way back in 1970 on one of the hottest June days of the year. I remember it well ……. I also lived in nearby St. Johns for thirty years and Pirbright was one of our favourite places for dog walking. When I spotted the High and Low series of 25 caches in and around Pirbright, I knew that this was one series I really wanted to do. Cockrobbinn and I had a free day on Tuesday, 8th September and as it dawned beautifully sunny and warm, we decided to pack a picnic up and head over to Pirbright to start (and hopefully finish) the series. Mind you, Pirbright is only 5.5 miles from our home ! We decided to park on the village green as the series comprised two loops and we thought that if we completed the first loop #1 – 13 and were in need of refreshment, we would be reasonably close to the car/village green and could probably stop and have a coffee. Good planning here. We set off up Church Lane, past St. Michael and All Angels which immediately brought back memories of funerals, rather than weddings. Why we didn’t stop for the Church Micro I will never understand, but nevermind it is now on our ‘to do’ list. Our first find of the day was easily found just over a little bridge which crossed a stream. This set the scene for almost all the rest of the series; every few hundred metres was another cache fairly easily found. I am most definitely not going to say the series was boring but I do like a bit more of a struggle to find some caches. What I loved most about this series was the memories it kept bringing back of ‘days gone bye’. We went along lovely footpaths around West Heath where long ago friends lived and my ex-husband and I spent many a boozy night playing Canasta whilst the children bunked down upstairs. This was usually on a Friday night after we had all been swimming in Guildford. My (now) husband – by the way, I’ve only had two (husbands, that is) – was fascinated by some of the tales I was telling but I most definitely didn’t tell him everything !!!! Some secrets are best kept ‘secret’. We very quickly completed the first half of the series and because it hadn’t taken us long, decided to carry on and try and finish before returning to the village green for our picnic. One highlight of the walk was when we were searching on a road sign and as a car drove past, a lady yelled out the window “you’re in the right place…”. We had one fairly difficult cache to find which was off the beaten track, quite deep in some pines and the GPS started playing up as it was very dense, but eventually we found it and scrambled back onto the trail. 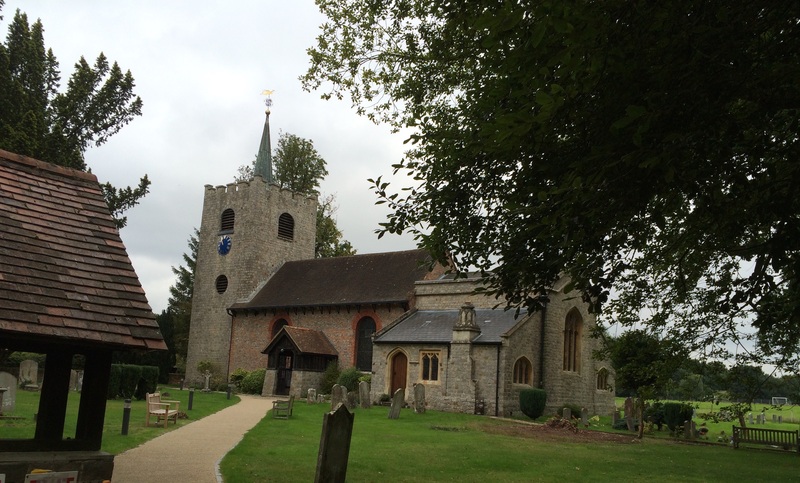 The funny thing was as we approached the final cache – number 25 of the series – we realized that we had already found it the previous year when my family had a celebration at Lord Pirbright’s Hall in the summer and it was very close by. Fancy not spotting that before we started. A really enjoyable 5 mile walk which culminated in a lovely couple of hours sitting on the village green in the sunshine, enjoying a tasty picnic of egg muffins (our staple diet for caching), chicken strips and a new recipe Banana and Raisin bread I had just made which always seems to give me hiccups – it is so delicious. I was delighted to pass Vines Farm where my late ex-mother-in-law was born and spent the next half-hour explaining to Cockrobbinn the various branches of the family as she had quite a few brothers, sisters and step-sisters. I also managed to drop the travel bug Ajay Bains into a convenient welly boot deep in the woods. 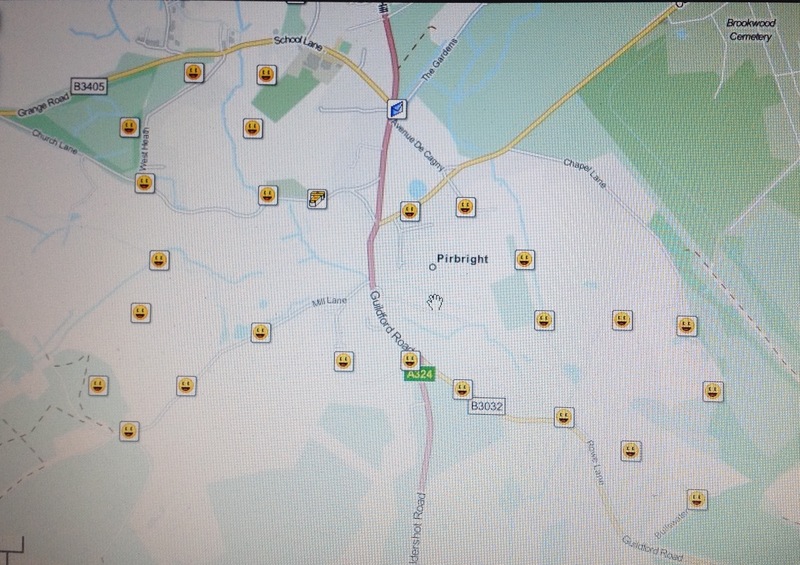 Nicely maintained series of caches and perfect for anyone new to geocaching as they are not too difficult to spot. 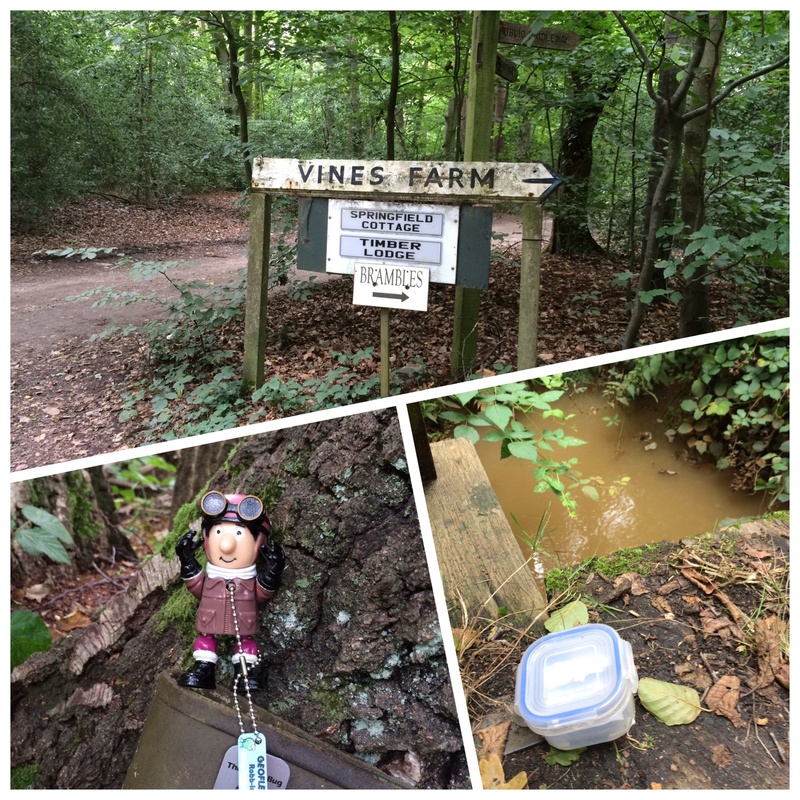 This entry was posted in Geocaching, Pirbright, Travel Bug and tagged Caching, Geocaching, GPS, Pirbright, Travel Bug. Bookmark the permalink. I’ve just been looking at some ‘within reach’ series and spotted this one GC5258R. It even gives a list of tools to take with you !! Might try it over the winter.